After surviving the 74th annual Hunger Games, Katniss and Peeta become icons to th degraded districts and targets of The Capitol by means of the Victor’s Tour. Essentially the winner of the Hunger Games parades around the districts showing off the success they inherit by surviving. The Capitol uses it as another form of control over the degraded and seemingly hopeless districts. This year, however, there are two winners because of the love stunt our two victors pulled during the games 6 months prior. President Snow (Sutherland) has a troubling visit with Katniss before the train left for the tour during which he told her that though she may not truly love Peeta, she needs to convince the districts that she does or he’ll do some real damage to the few people in her life that she loves. Under duress, Katniss and Peeta head out on tour. They quickly discover that what took place at the games has actually served as an act of defiance, thus stirring the pot a little bit within the districts. 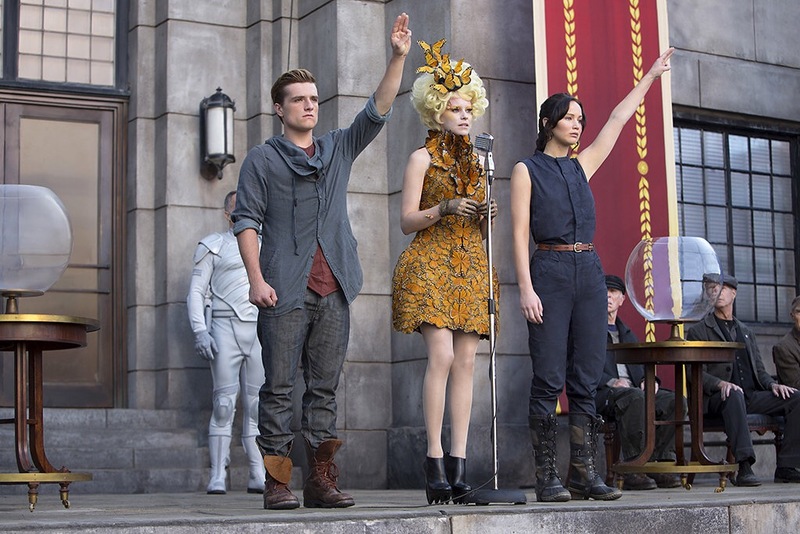 The people of district 11 were the first to see that Katniss and Peeta weren’t the average victors. 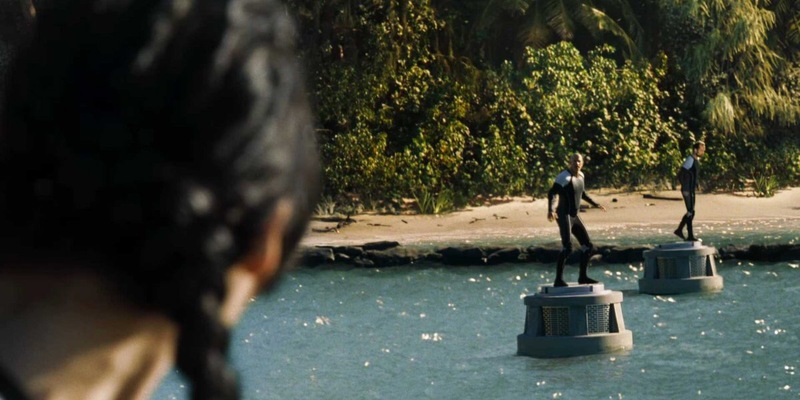 Instead of going with a scripted and rather glib speech, Peeta spoke from the heart, and both him and Katniss gave sympathy to the families of the fallen tributes of the games. A man in the crowd salutes to them and whistles the song of the Mockingjay further proving that revolution was near. President Snow recognizes Katniss and Peeta for what they are: threats to his empire so he announces that they are not exempt from the 75th annual Hunger Games and guess what…they were chosen. As they enter the games, Katniss and Peeta are forced to figure out what exactly they feel for each other and how they will survive another run at the games. Ok let’s break this thing down. First of all, the middle chapter of any trilogy is hard to do right. The first movie is building up characters which everyone loves, the third movie of a trilogy has the epic blowout battles and the plot crescendos. The middle is simply there tobuild up the story, which if the story is lacking in anyway it will fail, big time. Luckily for us The Hunger Games isn’t a straight trilogy but a fourth…ology? Weird. Anyways, you know what I’m saying. The final chapter is two acts, which definitely took a little heat of the sequel in the franchise. I loved the story of this one. It was built with the perfect balance of story and action, drama and romance, and just enough comedic relief to keep us from misery the whole time. The acting was superb and greatly improved from the fist go ’round. The film was also much more interesting as Katniss and Peeta struggle to understand what exactly they feel for each other. I sat there the whole time rooting for Katniss to see something in Peeta more than sympathy and when she does, it’s magic. The special effects were on point and visually the film was a lot of fun. For me the arena was the most fun. I was excited to see what they would throw at these kids this time and wasn’t disapointed. Overall it was perfectly rounded and left me screaming that the third installment wasn’t already in theaters.